It was the treacherously tumultuous period between October 20 and November 21, 1962, when the “Han” invaded India with the first incursion being at NEFA fealty — India’s North Eastern Frontier Agency — which witnessed the massacre of the Rajput battalion who were caught surreptitiously unaware in the dreary heights in 1962. The war which was more than a border skirmish was initiated with India defending with about 10,000-20,000 soldiers which were pitted against the 80,000 odd soldiers of the People’s Republic of China. The war ended when the Chinese declared a ceasefire on November 21, 1962. Some Cinematic portrayals, such as the flick Haqeeqat, beautifully portrayed the unmatched valour and singularly aesthetic spirit of sacrifice which the Indian forces displayed in the freezing heights of NEFA despite limitations imposed by a want of war fighting equipment and a lack of an appropriate infrastructure. New Delhi was caught napping as in the few roundtables between Prime Minister Jawaharlal Nehru and Commissar Mao, the rant of Hindi-Chini Bhai Bhai befooled the Indian Government and the nation was not prepared for a warring victory over the multitudes which were let loose on India in deluges after deluges. The shadow of the war still lurks behind India’s foreign policy and the Chinese hegemonising and containment strategies which are the final outpouring of all Chinese ministrations. It is these antecedents which prevent the normalisation of relations between New Delhi and the Han, and a veil of ubiquitous uncertainty and an anachronous trust deficit is in place as the mortal issues of territorial claims by the Chinese still mar the dialogues and Tibet remains a sticking point between New Delhi and Beijing. The facts and the depictions by Western chroniclers such as Edgar Snow pinpoint towards the power centric and sturdy ministrations of the Han nation, both in dealing with its internal turbulence and in its transactions with India. The rowdy and the fighting spirit is depicted in, Red Star Over China, which forms a substantial premise upon which the entire edifice of China is premised upon. The Chinese stratagem has always been the formulaic inaction of lying low and hibernating only to emerge as the powerful aggressor after gaining girth. It’s no tale that the Indian reaction to the Chinese invasion was knee jerk and the record was straightened out with the partial victory over Pakistan and the Nathula skirmish in 1967 as poignantly portrayed in the recent Cinematic creation, titled as Paltan. 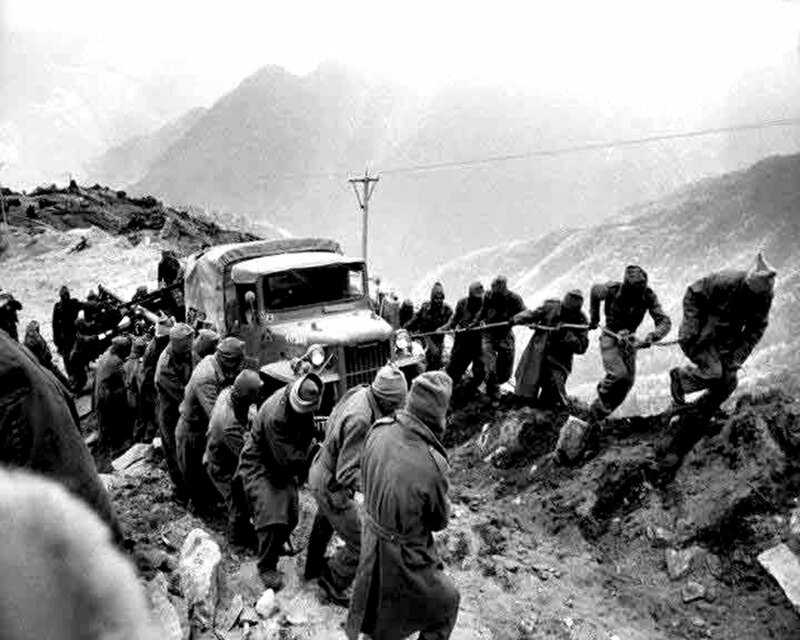 Provocations by the Chinese to arouse and inflame the Indian contingent at Nathula in 1967 remains a practice in the expanse of uninhabited frontiers. As India Today reports, “Around 3,250 Indian soldiers were killed. India lost about 43,000 square kilometres of land, captured by China in Aksai Chin. It is of the size of Switzerland. The 55th anniversary of the India-China war has a shadow of Doklam stand-off hovering over it. The anniversary is also significant in the view of the CPC Congress, where President Xi Jinping has emerged as the most powerful leader of the country in its history.” Thus, the singularly trenchant trend in China happens to be that of centralisation of power and the beginning of a new personality cult akin to what Mao Tse Tung developed around himself. The Long March and the other revolutionary systemic changes of the sixties and seventies in China are a matter of retrospect and till now the Chinese economic unison with the rest of the international system is partially well managed and orchestrated sufficiently, if not to perfection. There is a Prisoner’s Dilemma and Chicken hunt game revolving around the India-China border dispute. Both the sides are fundamentally distrustful of each other. The Chinese jingoistic veneer was at a full-mast-display at the time of the Doklam stand-off. Global Times wrote, “We firmly believe that the face-off in the Donglang area will end up with the Indian troops in retreat. The Indian military can choose to return to its territory with dignity or be kicked out of the area by Chinese soldiers.” Even in the JP Dutta’s war movie classic, Paltan, the heated verbal exchange between Indian commander Arjun Rampal and the Chinese Commissar makes for an interesting watch and analysis. When the Chinese Commandant at Nathula declares and threatens that the Indian contingent will suffer. Arjun Rampal stoutly counters by contending, “Do whatever you can, we are ready to suffer anything.” These instances might flare up the relationship’s chasms further, but for the nation, themes of moral uprightness and fealty to the nation along with the grandiloquent spirit of sacrifice are there to be given unmatched importance in the Indian military myth and lore. It is here that the sinews of the nation attains its synergy to defend its borders and sustain self pride which might seen anachronistic to a certain section living in the world of a conjoined geo-economics with the United States its President Trump straining at their leashes to isolate and counter the Chinese trade juggernaut all across the global polity ranging from Africa, Latin America to the neighbouring Indo-Pacific. Unfortunately, it was India which played a prominent role with others to mainstream the Chinese in search of durable and credible peace at the border. In the light of the 1962 border clash, Arun Jaitley contended that India in 2017 is different than what it was in 1962 referring to its improved and enhanced military strength in the contemporary context. China’s two territorial claims are the rattling elements for New Delhi. One being the claim over Aksai Chin in the north-eastern section of the Ladakh region in Jammu & Kashmir. The other claim is premised upon the demand of the territory of Arunachal Pradesh. The Chinese claim that in the Tri-party talks at the Simla convention in 1913-1914, the Tibetan side was taken to a separate room and the Chinese delegation was not adequately shown the documents, as also refereed in the Neville Maxwell’s, India’s China War. Sir Henry MacMohan detailed the Macmohan line between British India and Tibet which is based upon the highest watershed principle which the Han deny and do not accept as the correct demarcation of the boundary. These rationales exist as the “historic reasons” why the Chinese Maps portray a different scale of demarcation vis-a-vis the border. The original Chinese claim crosses these arid and mountainous regions, the way to the plains of Assam. Chou En-Lai had proposed that both the nations withdraw their forces for about twenty kilometres beyond the Macmohan line, which was a policy course rejected by India. The area of this disputed region is three times the terrain of Taiwan, six times the size of Beijing and ten times the size of Malvinas. A lot of water has flown down the bridge since the mayhem of 1962. The Wuhan Summit in 2018 was an ample symbol of intent by both China and India. Xi Jingpin’s outreach to the Japanese leader and PM Modi can be perceived as a striving to cement a Sino-centric world order to replace the US-led global order, sans the American grand strategy. The Wuhan dialogue need not be belittled as an attempt in optics and verbiage but it needs to be comprehended by observers as an informal summit with an eye to create the correct pitch for the both the nations to bat on to some concrete themes such as border solutions. In the age of New Diplomacy, Modi has made a searing attempt to pave the way for a steadying and normalisation of relations with Beijing despite the past. Page generated in 0.0219 seconds.